When it comes to collecting any type of paper currency, old or new, and after a decent quantity of notes have begun to accumulate, there is obviously the next phase in developing an storage method that helps to protect, organize, and display the collection. Generally, most currency collectors utilize any particular kind of clear plastic currency sleeve that serves to protect each note, while permitting easy examination from each side. There are basically three applications that have similar characteristics. There are single note-holders that are available in the marketplace, and are produced in various thicknesses, or mils, that envelop and protect the currency. This type of note-holder is then stored vertically inside a currency box, which is primarily designed to allow greater convenience when adding, removing, indexing, or just re-organizing the notes within the collection. The only down-side to this method it is a less-than-favorable means to effectively display them. 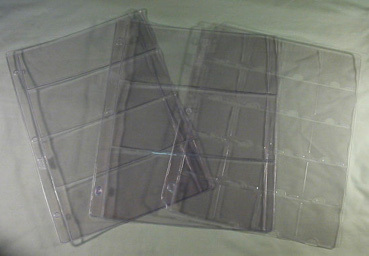 The next method would be the currency wallet or the larger currency album, which have the same clear plastic sleeve components within the cover or binding mechanism. These allow for much better display purposes, however, they are somewhat more expensive and re-indexing or organizing the notes can be a bit awkward. The third choice is referred to as a stock sheet, or currency page, which is in essence just an album page designed for use in a ringed binder. Effectively and safely storing any good quality currency collection is a task that can never been taken lightly. It is critical that only using a type of currency sleeve that is specifically designed to ensure the safety of that currency for extended periods of time. The materials used in fabricating these currency sleeves must be safe enough to be in prolonged contact with the currency. Inexpensive currency sleeves are prone to yellowing and cracking as they age, and are made from chemicals and contaminants that can seriously damage the paper over time. It is essential to only use products that are made for long-term archival storage of paper currency. The lesser quality plastics contain a chemical compound known as PVC, or polyvinyl chloride, which deteriorates over time and emits acids and gases which will transfer into the paper, causing the notes to appear as if soaked in oil, or so brittle as to shred at the slightest touch. The best way to guarantee that the currency storage method is safe is to use products recommended by currency, stamp or coin dealers. To keep currency in the best possible condition it is vitally important use sleeves or holders made of Mylar, which has been tested and approved for long term paper money storage. In other words, it is known as ‘archival-safe’. Common household products such as plastic wrap, plastic bags, or windowed envelopes should never be used for storing paper currency. Notes should be also stored or displayed out of direct sunlight to prevent fading. Vinyl Currency Sleeves – Crystal clear, semi-rigid sleeves that great for protecting or displaying currency notes. Sturdy clear inert plastic envelopes have visibility on both sides with electronically sealed edges provide protection for paper money and bank notes. Frame-A-Coin Vinyl Currency Sleeves – these currency sleeves are produced from clear rigid plastic, and are 125 mm thick with proprietary heat-pressed seams and precise mitered joints. SafGard Archival Quality Currency Sleeves – highest quality and archival safe, inert currency holders suitable for long term storage for all valuable banknotes. Manufactured by the makers of KOINTAINS and SAFLIPS. These currency holders are used by some of the largest museums and paper money dealers to house their paper currency. SuperSafe Museum Grade Currency Holders – these currency holders are archival safe, and made from 4 mil polyester, making them ideal for long term storage. The fold over design allows both ends to open for easier insertion of notes. Dupont Melinex Currency Sleeves – these quality currency holders are used by leading currency dealers and auction houses, along with the Library of Congress and the Smithsonian Institute. Capital Plastics Currency Holders – these currency holders set the standard in the industry for high quality, clarity, and complete protection of your currency notes. These screw-down type currency holders are made of crystal clear acrylic, contain no PVC and are perfect for long term storage of currency. Each half of the holder measures 1/8″ thick, producing an acrylic slab 1/4″ thick for superior protection of valuable bank notes.